One of the best gift's my husband ever gave me was the video he made the day our first son was born. I have watched it so many times over his short 2 year life and it is so special to relive that day. So, when our second son was on the way, he assured me he'd do the same thing so that we could have one for him. He's got a quite a knack for editing video and compiling songs to correlate. This video is such a treasure to me. 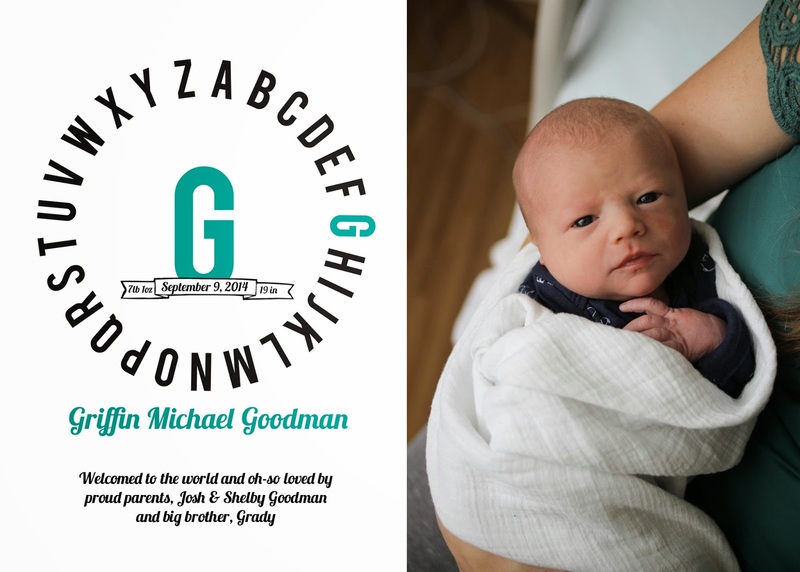 Griffin's Birth Video from Josh Goodman on Vimeo. While Josh has the video skills, I've got the graphic skills. So, I was in charge of designing his birth announcements. I had designed this birth print for his room and decided to combine that with a photo for his birth announcement. We are so in love with this new addition to our family!